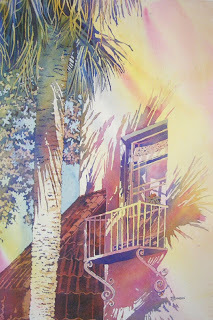 Watercolor Works: Cocoa Village Shadows - New Painting! Hot off the drawing board! This is my newest painting which will be one of the piece displayed in the ArtWorks Festival of Eau Gallie on November 20 and 21st. This was a fun piece and the colors came out quite nice. I am finally getting the hang of this pouring technique and adjusting it to my liking. I am finding that certain subjects work better than others and I have found a grouping of primary colors that work well together. There is very little brushwork on this piece; the majority of the painting was poured. It measures 23 by 32 inches framed.